The Brisbane City Council has just released the Draft Design Report for the long-awaited Brisbane Metro project, a high-frequency public transport upgrade to 21 kilometres of existing busway. Below is a detailed summary of this draft design report which also can be found here. While not a railway system in any form, the metro project plans to apply a lot of the basics of what a typical metro rail system offers. Contrary to popular belief, the system will not act like the typical bus service that Brisbane has become used to. Aside from aiming to reduce inner-city bus congestion, cut travel times and improve services to the suburbs, the project features a few important operational improvements which will fundamentally evolve the current busway network into what would look like a traditional metro rail line or ‘transitway’. The project will create two enhanced high-capacity metro lines using the existing South East Busway, and parts of the Northern Busway. Metro 2 – RBWH station to UQ Lakes station. Even with dedicated bus lanes linking the busways, buses must compete with other traffic at intersections, sit in queues and compete for road space with taxis, delivery vans and other vehicles. The effects of bus constraints are evident and visible on key parts of the busway network, including intersection congestion at each end of the Victoria Bridge, particularly at the busway portal at the intersection of Melbourne Street in South Brisbane. Capacity at Cultural Centre, South Bank, Mater Hill, and Buranda busway stations is also being reached during peak periods. As a result, bus services have been directed away from the busway corridor to Captain Cook Bridge in an attempt to improve journey times. However, heavy road congestion in peak periods is placing the performance of these services under pressure. This is leading to degrading travel times and reliability as well as worsening amenity in South Bank and the CBD. To fix bottlenecks, the Cultural Centre precinct will be serviced by a new state-of-the-art underground station for metro vehicles and buses. The new underground station is proposed to be located on a site at the intersection of Melbourne and Grey Streets, beneath the existing South Brisbane railway corridor, 125 Grey Street, and the Queensland Performing Arts Centre (QPAC) Green. The new Cultural Centre underground station will also incorporate a level of finish similar to existing busway stations (e.g. quality of tiling and glazing finishes) and a level of public realm that integrates the infrastructure to the local precinct. The station will feature full-height safety screen doors and will be designed to support potential low rise development above it. Victoria Bridge will be converted to a ‘green bridge’ for metro and bus services, pedestrians and cyclists. Removing general vehicle traffic will provide additional lanes for cross-river public transport, doubling the capacity of this important link. The two middle lanes will be used for Brisbane Metro and South East Busway services, with a lane on either side for other buses connecting to West End and New Farm. Access for emergency vehicles will be maintained on all four lanes. The existing on-road bike lanes will be reallocated, allowing the existing downstream footpath to be widened by 1.2 metres within the existing bridge width. This will further facilitate pedestrian movement and greater capacity across the bridge. Pedestrians will be encouraged through signage to travel on the downstream footpath. As currently occurs, cyclists will be required to dismount at each end of the bridge on the downstream footpath or use the shared path on the bridge’s upstream footpath. 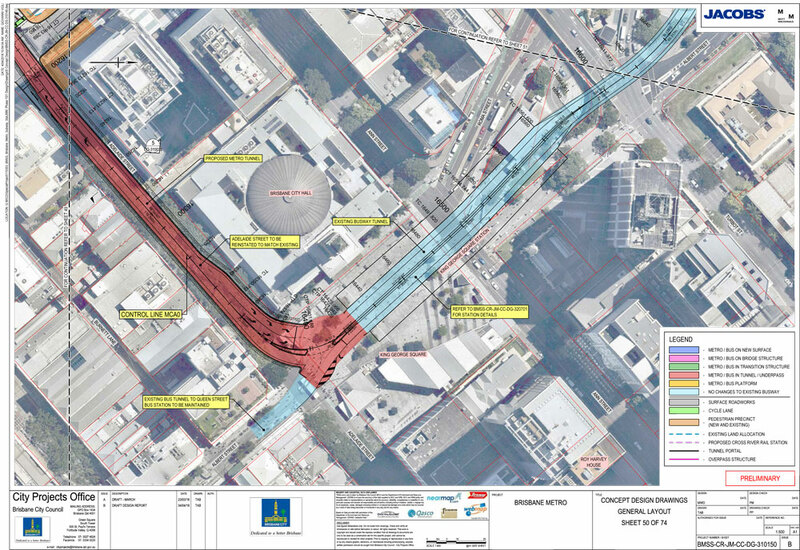 A new tunnel under Adelaide Street will connect from North Quay to King George Square station, completing the segregated corridor for metro and bus services. A tunnel portal and transition structure will be located at Adelaide Street, between North Quay and George Street. The tunnel will provide one lane for metro vehicles and buses in each direction. 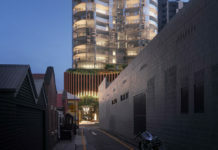 It will be 13 metres wide, approximately 200 metres long and up to 11 metres deep where it connects to the existing Albert Street bus tunnel and King George Square station. A connection will be provided to allow buses to access QSBS from the Adelaide Street tunnel. Fire and life safety measures will be integrated into the tunnel design, including fans for smoke extraction, a fire isolation corridor and emergency exit paths and points. Access for surface buses on Adelaide Street will be maintained, with buses travelling on either side of the tunnel portal between George Street and North Quay. A depot facility for metro vehicles will be located at School Road, Rochedale, adjacent to the South East Busway. The proposed depot site will be approximately 55,000 square metres and will require Council to acquire four private properties and a property currently owned by the Department of Transport and Main Roads. Direct access to the depot for metro vehicles will be from the adjacent South East Busway. The metro depot will generally operate between 20-24 hours per day, seven days per week. Council has commenced discussions with landowners about acquiring the properties required for the depot. The depot will provide stabling for the initial fleet of 60 metro vehicles and have capacity to accommodate growth of the fleet in line with demand. A new fleet of 60 high-capacity metro vehicles will be introduced, each able to carry up to 150 customers. However, according to industry specialists, similar bi-articulated buses in operation overseas can achieve a patronage of 200 to 250+ passengers. The vehicles will be approximately 24-25 metres in length. On-board features such as Wi-Fi access, customer information systems to provide real-time travel updates, and public/voice announcements of the next station. The metro fleet will expand over time to accommodate growth in services. 5am Friday to midnight Sunday (i.e. all day Saturday and Sunday). In the year of opening, metro services will operate at three-minute frequencies during peak periods. During daytime inter-peak, metro services will operate at about five-minute frequencies. Over the subsequent years of operations, metro frequencies in peak periods will continue to increase in line with demand. The Brisbane Metro plans to turn the busway network from a direct service (single seat) model to a hybrid network. The Brisbane Metro will act like a trunk metro service that operates as the primary service along the busway and is supported by numerous ‘feeder routes’. Many current BUZ (high-frequency) and Rocket (peak-only express) services to the CBD will continue to operate, retaining a strong complementary network of suburbs-to-city services for existing bus customers. Other current lower patronage bus services will feed high-frequency trunk metro services on the busway. Transport experts praise this evolution and see a hybrid model as a more efficient use of the existing bus fleet and infrastructure. 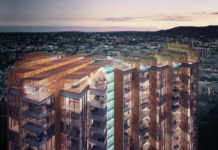 A trunk service allows lower density areas to benefit from additional services which, in turn, connects areas to the Brisbane Metro trunk service. This will reduce bus congestion on the busway and in the CBD, helping to improve travel times and reliability. At the same time, customers will benefit from an easier-to-use network and better, convenient connectivity to a wider range of growth destinations. This will be supported by improvements to other high-frequency distribution services, such as Council’s CityGlider network and the Inner City Loop. BUZ and Rocket services capped at the practical on-road capacity of 12 services per hour. Additional capacity provided by feeder services to Brisbane Metro or by articulated buses. The introduction of Brisbane Metro is not proposed to affect bus services operated by private operators. Implementation of new passenger information display systems to support the platform management and information system and inform customers of the stopping bay for approaching or departing metro vehicles and buses. Real-time vehicle location tracking to support dynamic vehicle bay allocations. Construction of the main works for Brisbane Metro will generally occur over a period of approximately 2.5 years. Pre-construction works, including some service and utility relocations, will be undertaken prior to the main works. All information is available to view at Brisbane Metro Draft Design Report. Even with burgeoning population and increasing number of residential developments to the west of Montague Rd West End there is no additional transport service planned? One solution would be a metro tunnel running the length of Montague Rd with pedestrian exits either side. Amongst other things this might reduce the risk vehicle pedestrian impacts as 100s of people attemp to cross Montague Rd in peak hour with only one traffic light between Orleigh Park and Mollison Street. The probabilty of a death at Victoria St Glider stop must be high, given the numbers of people who are forced to “play chicken” with the traffic every day at the top of a hill. The BCC approves developments for 100s of new residents serviced by one bus stop and does nothing to ensure their traffic/pedestrian safety. A high proportion of residents have school age children. Residents wonder if the area was a Liberal ward would something have done already. Additional peak hour Glider stops might mitigate some risk by spreading pedestrian traffic out along Montague Rd. Fantastic ! What about also converting the busway running alongside the M1 from Mt Gravatt ? Up date on Ellen Grove Railway Station? Where have the beautiful large Leopard trees on Adelaide street gone? There are no trees shown on the cross section? Good start… we really need a circle line… not all public transport should go through the city. Eight mile plains is a good place to Roma st then start working towards it in mid 2018. Ipswich Rd – is it possible in the future we could see the return of trams or introduce light rail? Will there be a busway extension into Springwood? New Metro Busway should end at Springwood to the south! New m1 upgrade at eight mile plains should include this metro busway! Great to look at infrastructure to reduce car traffic (and parking) issues in cbd as well as getting people into cbd quickly. How about also addressing the lack of access across river from Go-Between bridge and Guyatt Park? If we can’t have a ferry stop or two on West End side, why can’t we have a footbridge or two? to work when a footbridge or two, connecting to buses and bikeways could potentially solve a large congestion issue. Action needed sooner rather than later! The parking at Eight Mile Plains, although large, is already over capacity and residents are having difficulties getting into their driveways right now. This was once a quiet estate. Will the parking be extended into the space that is currently being used for council equipment storage in Holmead Rd? It is very needed.